I gave up and gave in. But there's rules, mind you. Absolutely no head-to-toe pink! Over my dead body! Okay, this pink frock is kinda subdued. Fine. But I still get the last word while you're living under my roof, young lady. It's from this japanese craft book, pattern D-1.......except I scooped and shirred the centre front. I also played around with my spanking shiny ruffler foot, to add some length to the bottom and more drape to the dress. One last modification (I couldn't help myself), a separate elastic casing to the back, to match the fabric on the ties. It looks so sweet! She's been prancing around in it for the last couple of hours, so thumbs up I reckon! Yes, I'm back to stroking the fabric and revving the machines again. It felt restful to be pottering around in the sewing room. I've already queued up the next project. Okeydokes, I gotta potter back to the meatball pasta. The troops are grumbling. Hope you're all having a great weekend! Cheerio! It's gorgeous Jade and has certainly made your little model look happy. 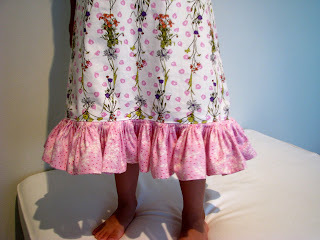 Amazing what a spot of pink can do (and I love the hemline - truly ruffle-licious!). Oooh meatball pasta -- that sounds yummy! And The Bub is looking adorable in her new frock. Too, too cute!!! Oh what a little doll she is! Super gorgeous dress and she must love swirling it around. There is an excessive amount of pink in this house of course!! I love it jade, so beautiful!